The Osteoglossomorpha, commonly referred to as bonytongues, is a morphologically heterogeneous group of basal teleosts. The Osteoglossomorpha comprised highly derived subgroups such as arowanas, butterflyfish, and Old World knifefishes. There remains controversy over the interrelationships and the associated divergence times of osteoglossomorphs. The Osteoglossomorpha is widely recognized as a monophyletic group composing six families and has a long evolutionary history dating back at least to the middle Jurassic. Considering the poor fossil record of extant major osteoglossomorph groups and the fact that they may have acquired specialized morphology early in their evolutionary histories, it is no wonder that comparative anatomical approaches have faced difficulties in addressing their origins and relationships. 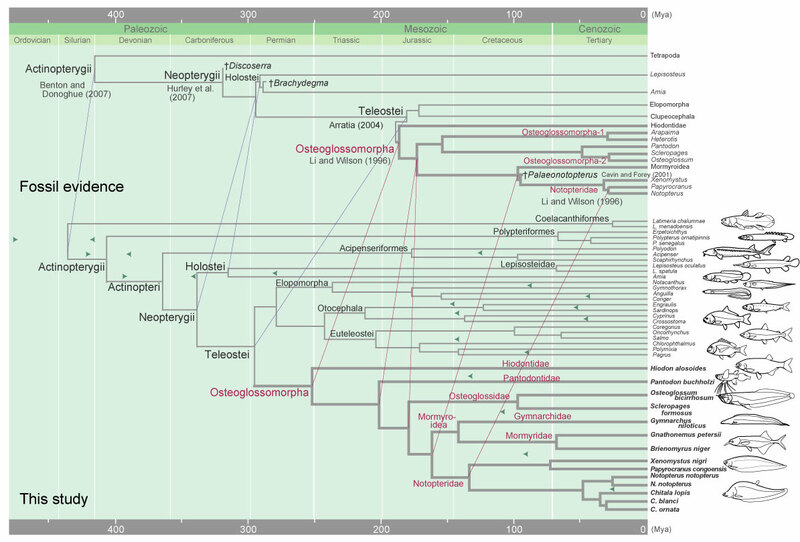 The purpose of the present study is to estimate the phylogenetic relationships and divergence times of osteoglossomorphs. We used complete mitochondrial genomic data from 40 purposefully chosen species that fully represent the major teleostean and osteoglossomorph lineages. Although the close phylogenetic relationship between Gymnarchidae and Mormyridae (Mormyroidea) has been supported by several lines of evidence, both morphological and molecular, there have remained persistent controversies over familial relationships in Osteoglossomorpha. When we conducted the phylogenetic analysis using mitogenomic data, the resultant trees were well resolved and supported monophyly of the Osteoglossomorpha and previously proposed molecular-based hypothesis on the inter-familial relationships (G: Lavoue and Sullivan, 2004). Molecular dating using the partitioned Bayesian approach based on the mitogenomic data estimated the divergence of Osteoglossomorpha from other teleosts to be around 295 Mya with the 95% credibility interval to be 272-319 Mya. Within the Osteoglossomorpha, interfamilial splits ranged from 142 to 253 Mya. Our time estimations were in agreement with recent molecular studies. Recently Hurley et al. (2007) presented new paleontological evidence that the basal neopterygian radiation is a Palaeozoic event. The new minimum date for the basal neopterygian split, marked by Discoserra from the Mississippian (>318 Mya) and Brachydegma from the Early Permian (>276 Mya), aligned closely with molecular estimates. When we conducted the dating analysis without the lower constraint based on Brachydegma, Brachydegma fell within or close to the lower limit of the 95% credibility time range for Lepisosteidae/Amia split as shown in Hurley et al. (2007). 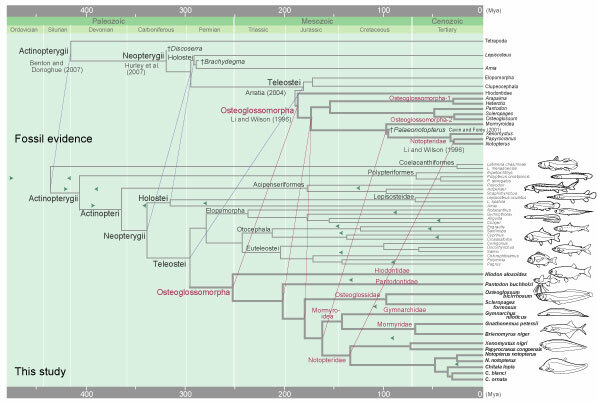 The dates for some familial splits (Pantodontidae/Notopteridae and Osteoglossidae/Notopteridae), marked by abundant fossil records from extinct osteoglossomorph lineages (Li and Wilson, 1996), aligned closely with our molecular estimates. Our estimates for Osteoglossidae/Notopteridae split (179 Mya) was close to the fossil-based estimate (>157 Mya). In addition, the minimum date of 94 Mya for the Mormyroidea/Notopteridae split marked by Palaeonotopterus (Forey, 1997; Cavin and Forey, 2001), which is some 59 million years (Myr) older than the previous estimate from fossil (Li and Wilson, 1996), is now closer to the molecular estimate. However, our estimates for the basal divergences within Teleostei (295 Mya), Osteoglossomorpha (253 Mya), and Notopteridae (133 Mya) were still older than those deduced directly from the fossil record. On the basis of the paleontological evidence, Arratia (2004) considered that the osteoglossomorphs diverged from the other teleostean groups approximately 170 Mya. Li and Wilson (1996) suggested that the split between Hiodontidae from the other osteoglossomorphs was around 160 Mya. We do not consider that the gap between molecular and fossil-based estimates simply resulted from potential errors in our molecular analysis. Regardless of the root node or tree topology, all analyses agreed to place the earliest diversification of teleosts in the early Permian. Rather, we suspect that the gap between molecular and fossil-based time estimates reflects a long held view that Mesozoic teleostean fossils are impoverished in general (see, e.g., Patterson, 1993; Kumazawa et al. 1999; Helfman et al. 1997). Alternatively, the discrepancy between our estimate and those based directly on the fossil record may result from the possibility that lineage separation does not always accompany morphological diversification as suggested for eutherians (Hasegawa et al., 2003). Dating analysis based on both the molecular and paleontological data might help to reconstruct the major patterns of modern teleostean radiations that could not be recovered from fossil data alone.